Pay government fee only and save hundreds on agent fees. 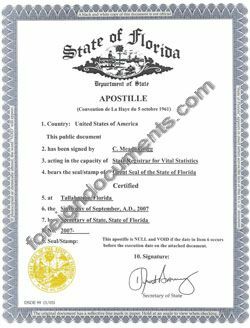 Receive Florida apostille by mail or in person. Do it yourself and make it cheap and quick. If, for any reason you need an agent assistance, please submit the International Authentication Request Form to get a price quote for our apostille service. Mail us original document, and we'll take care of the rest. Rely on experts and make it worry-free. Read about apostilles in Apostilles in Q&A.